The cartooning how-to book hasn't changed much over the years. From those classic treasury-sized Walter Foster books to modern manga instructionals, they all teach the same basic methods- "Sketch geometric shapes, add detail, ink!" Regardless of advancements in tools, such as with Photoshop ( DC has some cool volumes on that), basic drawing rules still apply forever. I guess that's why ADVENTURES IN CARTOONING takes a different approach. It doesn't try to teach rendering skills. Why bother when HOW TO DRAW COMICS THE MARVEL WAY is still available? And who can compete with John Buscema anyway? 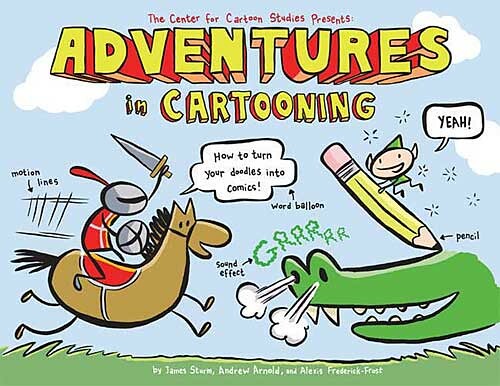 ADVENTURES is all about how to tell a story through the language of comics. Authors James Sturm, Andrew Arnold, and Alexis Frederick-Frost have created a beginners guide for the younger kids who are still drawing stick figures. Or maybe they're drawing more detailed figures. It doesn't really matter since this book is about storytelling. The entire tale is told in a minimalist style that doesn't intimidate the beginner. And it is a self-contained comic book, by the way, not just a collection of dry instructional chapters. The story follows the adventure of a knight racing to save the princess from the lair of the dragon. Throughout the book a floating elf appears to instruct the knight on how to navigate the parameters of comic book panels, word balloons and gutters. He shows the knight how expanding a panel will improve his view, how a dotted line panel indicates that he's stuck inside of something and how the proper arrangement of word balloons will make it easier to understand what a group of characters are trying to tell him. It's a clever and maybe just kinda revolutionary way of teaching kids the language of comics. The simple drawings make it easy to spot all the mechanics that go into making comics. And it's a fun, fun read besides. The authors know what they're talking about. Eisner-nominated James Sturm is the director of The Center for Cartoon Studies in Vermont. Andrew Arnold and Alexis Frederick-Frost are both graduates of the center. They gear the story to the young reader. The art is designed to look easily imitated. The lessons are reinforced by repetition throughout the story. This is the best kind of how-to book. It not only teaches, but it can inspire kids to practice and learn more.